A massive general strike erupted in Oakland, California, late in 1946. One hundred thousand members of the American Federation of Labor (AFL) shut down the economy of four local cities for two and a half days. Thousands of strikers took over the streets of downtown Oakland. It was an explosive, spontaneous protest against police intervention against picket lines, and against employers’ refusal to recognize the union of the newly organized retail workers. Why did these tens of thousands of workers feel so threatened that they would engage in such a protest, and why did their protest take the form it did? Was the general strike a local anomaly, or did it reflect national labor developments? But, unlike the 1934 General Strike, the Oakland General Strike of 1946 did not spread to the rest of the Bay Area, or have a radical leadership, or lead to new organizing drives. Both occurred during great turning points for the labor movement. But the Oakland Strike stood on the threshold of the Cold War. Labor had sacrificed its blood and its right to strike in order to win a war that it believed would destroy fascism abroad and bring a new era of prosperity and democracy to American society. Now, as these hopes seemed threatened, the General Strike brought the War to the streets of Oakland. The employers and the police were now viewed as threats to democracy, to civil liberties, and to the standard of living of workers and their families. But the General Strike, a highly dangerous and unstable weapon, did not achieve its immediate aims. The threats to labor remained. In the aftermath, the unions turned to independent political action. But this initiative was blunted by splits in the labor movement occasioned by the growing issue of Communism, by AFL-CIO rivalry, and by the efforts of conservative labor leadership to preserve their power and privileges. Would the labor movement unite? Or would organizational and ideological antagonisms frustrate the attempt to translate the momentous power displayed in the General Strike into political independence and power? The employers did little to allay these fears. With war contracts gone, with a strong mood of patriotism prevailing in society, and with nostalgic longing for the reaction of the 1920s, corporate America was prepared for a showdown with what it believed to be the overgrown power of labor. But the great strikes of 1946 resulted in no clear victory for either side. The unions were not smashed or appreciably weakened. And the corporations were able to maintain their threatened prerogatives intact. Instead, there evolved a new set of bases for labor relations as America moved into the Cold War: renewed prosperity founded both on U.S. preeminence in the world and absorption by a permanent arms economy of the “overproduction” (crisis) of the 1920s and 1930s; national legislation designed to severely limit trade union power, and, due to the system’s proven inability t take on the unions frontally, the persecution of Communists and other dissidents in the labor movement – thereby removing an all-important stratum of grassroots leadership who might point the movement in a more radical direction. The labor movement had been bureaucratized during the late New Deal period and even more so during the War. This development continued apace. Labor would largely abandon its ideas of social change and accept the role of interest group assigned to it by pluralist ideologues. While the immediate results of the 1946 strike upsurge had been a stalemate, the long-run consequences were a defeat for labor. Organization of the South remained a dead letter. As countless union activists were hounded, blacklisted and silenced, a pall of fear and suspicion settled over the factories and union halls throughout the country. Labor’s shock troops, the coal miners, having been forced to end their strike, were impoverished and debilitated by technological and resource-use change. The millennium, which millions longed for in the ‘30s and ‘40s, moved to the suburbs, while a permanently underemployed underclass was left to rot in urban centers. But the most dramatic and visible difference between the previous history of labor and that of the 1950s was the near-absence of picket line violence. There were two basic causes for this. First, the unions were house-broken and brought into a lopsided consensus in which the narrow economic interests of groups of highly organized workers were advanced at the cost of making the unions agencies for disciplining the workforce and providing the corporation with the means of long-range planning through the device of long-term contracts. Second, and perhaps more important, this consensus and avoidance of confrontation grew out of the immediate post-war experience: each time the employers attempted to break picket lines in 1946, they were met with furious resistance from the workers. General Motors settled down that year to starve out its striking employees. No attempt was made to crash picket lines. This strategy, bolstered by de facto government strike insurance, worked. In the electrical industry, however, there were numerous violent confrontations reminiscent of the ‘30s. Perhaps most telling, however, were six local general strikes in 1946 in small cities around the country, the spectacular being Oakland’s. It achieved a kind of quasi-insurrectionary dimension. It was this kind of response, coming from a variety of labor groups, and showing an unprecedented determination to defend and consolidate past gains that tilted employers towards the GM-type, pacific strategy for the ensuing period. Labor had used revolutionary means in the 1930s to achieve the most limited reforms. Now labor made it clear to all that it was willing to continue that tradition. Labor was not to be broken by direct means, but by reinforcing the bureaucratism and conservatism already apparent within it. The Oakland General Strike can be seen as a kind of laboratory for the development of these trends: a local establishment determined to thwart unionization among department store employees, a local labor movement equally determined to stand behind the store workers, massive intervention by the police to break picket lines in the ensuing store strike, and the massive response that followed. The general strike had highly ambiguous results. As a dramatic show of labor power, it gave local trade unionists and their sympathizers a renewed sense of their own strength, while it effectively put an end to the use of police in labor disputes. The employers were badly frightened by the result of their use of police power. But frightened, too, were the labor leaders who had helped to summon up the demon of insurrection. They would attempt to continue the fight in the political arena. But, as the dust settled, the labor movement split, scapegoats were found and persecuted, and the disillusionment born of the fact that both economic and political action failed to win justice for the store employees turned to bitterness and quiescence. In January 1946, the GM workers were joined by massive strikes in many of the nation’s basic industries – steel, rubber, electrical, packinghouse – until nearly two million people were on strike. But the other unions did not take up the UAW’s novel and radical anti-inflation demand, and eventually settled for wage increases that lagged far behind increases in the cost of living that had already occurred, leaving the GM workers to continue their strike alone. Finally, the GM strikers were forced back to work through exhaustion. Their fight had been undercut by the more conventional bargaining strategies of the other CIO unions. In such a contest with the corporations, where private property prerogatives were being challenged, the UAW could not win on its own. During the strike, Walter Reuther warned the workers that the employers were preparing to mount an open-shop drive similar to that of the 1920s: “Should we lose [the strike]”, he said, “it would be 1919 and the twenties all over again.”4 This warning was heard again and again throughout the labor movement in 1945 and 1946. Its validity was reinforced in May when Truman threatened to draft striking railway workers into the armed forces. The rail unions capitulated before this threat, but the labor movement was deeply angered and frightened. Truman’s political strength among trade unionists sank to zero. In the coal mines, too, there were repeated strikes, growing out of those during the War. Here again, preemptive nationalization played a role, but had the added dimension of being part of union strategy. Lewis counted on getting from the government what the coal operators would not grant. The miners were too strong to yield to the threat of the military draft – they had already braved that storm during the War. The UMW-Truman confrontation came to a head at exactly the same time the Oakland General Strike occurred in December. The miners were forced to bow to the pressure of an injunction – the first time such a device had been used since the Norris-La Guardia Act of 1932. This initial success had two effects. First, it gave a big boost to union morale, and encouraged many workers at other stores to organize. But it also threatened to break the anti-union solidarity of the storeowners, who now intensified their resistance to the union. By October 31, they were followed by the Kahn’s workers. The people were well organized. The strike votes had been overwhelmingly favorable. Heavily attended meetings of strikers were held each morning prior to the day’s picketing. The stores were blockaded by mass picket lines. The unions made aggressive and successful attempts to reach the buying public with radio broadcasts, 50,000 leaflets explaining the dispute, and a campaign to persuade Kahn’s credit customers to cancel their charge accounts. There was strong sympathy for the strikers, most of whom were women. Not only did they receive crucial support from the Teamsters who honored the picket lines, but from the other unions, many of whose members volunteered their free time to join the strikers at the store entrances. Even before the general strike, therefore, activists—both rank-and-filers and officials – of a broad cross section of the labor movement were meeting each other on the strike scene. This contributed to a growing sense of common purpose and struggle and sentiment, as the strike dragged on, for a general strike. The gauntlet has been thrown down … The labor movement … must accept the challenge of Kahn’s and fight it through to the finish. … Indiscriminate firing of employees, coercion and intimidation and preparations for industrial warfare we thought were almost outdated in our country, but we find we are wrong. Telling employees what they can and cannot say is decidedly un-American and speaks more like conditions under the Nazi heel and totalitarian regimes than it does of the beautiful city of Oakland. The women’s militancy infected other unionists who joined the picket lines, especially the Teamsters whose presence and support were so vital. The Retail Clerk’s union had always relied on Teamster support in strikes because retail workers are relatively unskilled and easily replaced. The stopping of deliveries, therefore, often is the key to success. So, as Local 70 Teamsters refused to cross the Kahn’s-Hastings picket lines, the store shelves began to empty as the Christmas season began. Teamsters’ work lives are cohered, not by their common endeavors with fellow truck drivers so much as by the myriad contacts with workers in all fields of commerce and industry made while delivering and picking up freight. Their identification with other workers therefore extends to the whole economy. Their work experience, their organized strength, their strategic position in the economy, can tend to make them, in periods of heightened labor activity, the missionaries of trade unionism. This was especially true in Oakland, where there was little heavy industry, where transportation played a disproportionately large role in the economy, and where the rank-and-file Teamster had a long tradition of honoring the picket lines of other unions. Local 70 was the most powerful trade union in the East Bay. The open-shop drive is on at Kahn’s and Hastings and the plans are all made and set to repeat the program that followed World War I, the establishment of the open-shop plan throughout industry, so that the working man and woman can again be driven to their knees and organized labor can be smashed. Broadway and Telegraph Avenue between 15th and 16th Streets has become the battleground for the open-shop drive of 1946. Shortly after 7:00 a.m., a convoy of delivery trucks and Berkeley and Oakland police in squad cars and motorcycles came down Telegraph Avenue, crossed the police lines, and made deliveries to Kahn’s and Hastings. At about 10:30 a.m., another convoy delivery was made. The trucks were owned and manned by GI-Veterans Trucking, a professional strike breaking outfit from Los Angeles. By the time of the second delivery, there were several thousand people in the streets outside the police lines. They were dismayed and angry. The many union officials on the scene felt betrayed by City and Police officials who had warned them in advance of the deliveries but not of the police show of force. They had also been told that they would be allowed to search the strike-breaking truck drivers for weapons. Seventy-five AFL business agents had picketed the stores all night in anticipation of the striker breakers’ arrival. The day before they had been told by the police that they could part their autos around the stores and that these would not be interfered with. In addition, the police had informed them that the deliveries would be coming in from Los Angeles. For the previous day and a half, union scouts had been scouring the highways to the south with no result. It turned out that the merchandise had been in storage in Hink’s Department Store’s Berkeley warehouse for a week. They pushed us out to 17th Street, then down to Broadway and Franklin, then to 12th. They set machine guns right in the middle of the square facing Kahn’s. What we didn’t know is that they had stored the merchandise at Hink’s in Berkeley. Then came the parade. Right down Telegraph Avenue. First came Chief Tracy in an open car with Paul St. Sure, head of the United Employers, and Joe Knowland – all bowing to the populace. They were going to put the labor movement in their place. The only thing missing was top hats and a brass band. Then came the trucks; they unloaded and went back for more. With the police action, all bets were off. For months, unionists had been discussing the threat of union busting, of an open-shop drive, of anti-labor legislation pending in Congress and the State Legislature. The first Republican Congress in fourteen years had just been elected November 5, as middle class opinion, appalled by inflation and the wave of strikes, swung decisively against labor. It now seemed that the employers and the authorities were acting on a mandate to “put labor in its place”. The Labor Journal had equated the employer position in the Kahn’s strike with an open-shop impulse. On November 20, 500 union officials had met under Labor Council auspices to discuss ways of bolstering the clerks’ strike. Many voices were raised from the floor for a general strike at that time. Now, on December 1, it seemed as if the validity of these warnings was plain for all to see. What had begun as a relatively minor organizing drive by a traditionally weak union now had grown into a general revolt, not only against the employers directly responsible for crushing the picket lines, but against the police, the city, and the employers as a whole. People now felt that the social contract implied by the New Deal – that workers’ rights would be guaranteed in a democratic society – had suddenly been called into question. The Teamsters were especially outraged by the use of strike-breaking truck drivers from Los Angeles. From the traditional citadel of the open shop came professional scabs – who specialized in breaking strikes for the notorious Merchants and Manufacturers of Los Angeles – to invade a union town. The open shop did indeed seem to be coming to Oakland. The Teamsters had made the clerks strike. Now, as hundreds of them poured into the downtown area, it was they, more than any other union, who would make the strike general. At about noon, the Carmen, having watched the dismantling of the police lines, suspended their impromptu protest and returned their cars and buses to their barns. About 75 union officials retired to the Labor Temple to discuss the situation. It was at this meeting that the necessity of calling a general strike was formally raised. But the momentum for such an action was already uncontainable. Thousands of labor people had filled the streets, with strike-breaking employees trapped inside the struck stores. At the meeting, Jimmy Marshall, President of Local 70, demanded that the assembly vote a general strike, saying that anyone who voted against it was “chicken.”19 He declared that if the meeting failed to vote for a general strike, Local 70 would strike on Monday alone. Others objected that, while a general strike should be called, it should be postponed until Tuesday, to give the unions time to reach and organize their ranks for action. A larger meeting was called for Monday morning, when more union representatives could vote on and plan for a general walkout. Tuesday morning’s turnout was nearly complete, far exceeding the wildest dreams of the participants. The industrial and residential districts of Oakland, Alameda, San Leandro, and Hayward were silent, the streets empty. “It was amazing,” remembers a witness who was opposed to the strike. “It was like the earth stood still. Everything stopped.”21 Twenty-thousand people came downtown to join the pickets. Some workers joined the strike in organized contingents, marching from their union halls. Roving squads of Teamsters patrolled the streets and highways, bringing most commercial transport to a halt. AFL Teamsters set up a picket line on the Eastshore highway at Gilman street to “screen” trucks headed towards Oakland. Those loaded with perishables or livestock were allowed to proceed, with a warning against deliveries to retail outlets. Drivers of trucks bound beyond Oakland were advised to detour around the city. No violence was reported at the “screening” line. The planning at Monday’s official meeting had been incomplete and confused. The word of the strike apparently had not been communicated to workers at downtown restaurants, all of which opened early Tuesday despite “rumors” of a general strike. By 8:00 a.m., all the unionized restaurants had been closed down, not by the Culinary Union, but by Teamster pickets. There also seems to have been huge gaps in official implementation of the shutdown. An army recruiting truck cruised around the area. The second lieutenant at the megaphone made some derogatory remark about the pickets. Immediately from the strikers’ ranks came sailors and soldiers wearing overseas ribbons. Led by a tough-looking former top sergeant, they marched in formation down the streets, shouting, “We fought this war overseas, not in a recruiting truck”. Nothing more was heard from the second lieutenant. Of course, no one would suggest any such thing. But what could be done to make the most of all this tremendous enthusiasm and militancy? Ash and other speakers called on the audience to come downtown the next day, and predicted that the strike would spread. So far, the employers were still unwilling to concede anything, despite the General Strike. They had offered a vague and gutless “fact-finding” settlement. So, the General Strike must continue. On Wednesday, the downtown crowds grew at one point to 35,000 people. They seemed as determined as the day before to “fight to the finish”. The ambiguity and chaos surrounding Monday night’s strike call had clearly been put aside by the mandate displayed by Tuesday night’s mass meeting. The big questions on Wednesday were: Would the strike spread? Would the employers and the City come to terms, or instead resort to repressive measures as the Mayor had threatened? Would, for instance, the Governor call out the National Guard, as was now being rumored? Finally, would national and regional AFL leaders find a way to force the strikers back to work before the strike’s objectives had been won? Ash says that he called Governor Warren in Florida to ask him about these rumors. Warren assured Ash that the use of troops was not being contemplated. Warren, after all, aspired to the U.S. presidency, and had painstakingly built up an image of a friend of all social classes. He was not eager to destroy his political ambitions by using troops. Hassler was Warren’s man in Oakland. That isn’t true … They pulled it while I was on my way to Washington. I suppose they’re using my name for effect on the employer group, because I have been close to the employers and have worked these things out peacefully. I went to emphasize that the employers never asked us to deliver merchandise to these stores. If they had, we probably would have worked out an arrangement to make the deliveries. The International Brotherhood of Teamsters is bitterly opposed to any general strike for any cause. I am therefore ordering you and all those associated with you who are members of our International Union to return to work as soon as possible … No general strike has ever yet brought success to the labor movement, On the contrary, the only result of the general strike is to persecute and inconvenience the public and seriously injury the thousands of fair employers with whom we have contracts. But Beck seemed to make this order contingent on the willingness of the employers to arbitrate the Kahn’s-Hastings strike. He told the press on Wednesday that he would send the teamsters back to work if the employers “… do not disrupt things by some covert act such as refusing arbitration.” The store owners would have at least to concede to putting the issues before a neutral third party. Real added his voice to this position. The question remained, however, about what was to be arbitrated. The basis stumbling block to settlement that had existed on the two struck stores or on all Retail Merchants’ Association member stores – was now the issue which prevented the establishment of ground rules for arbitration. St. Sure continued to insist that arbitration establish association-wide elections. The Clerks were equally determined that such an election be confined to the employees at Kahn’s and Hastings. Despite Wednesday’s big crowds and their militancy, therefore, momentum was building for an end to the Strike. The militants – those committed to continuing the Strike – were pinning their hopes on CIO intervention, on its making good its threat to join the general walkout. For those anxious to end the Strike, some settlement would have to be reached before the CIO’s Thursday night deadline. Beck carried his point. Wednesday night, the AFL committee met with Hassler and the employers, who still refused arbitration on any but their own terms. After the employers retired from the meeting about 0”00, the union and Hassler continued to negotiate. At 4:00 a.m., the meeting broke up – the union committee had a promise from Hassler that Oakland police would not be used to break “legal” strikes, and the G.I. Trucking Company would be removed from the Bay Area. Pending a vote of AFL officials, the Strike was over. At this point the employers, “in light of last night’s events”, decided to withdraw from any further discussion of arbitration. The store clerks would not benefit from the settlement. The Labor Council leadership had told the workers that Hassler’s appointment signaled victory for the Strike. Five months later, however, with the Kahn’s-Hastings workers still on the picket line, the Labor Journal told a very different story, one that the editors must almost certainly have known all along. Denouncing Hassler as “heir apparent” to the Knowland machine, they claimed that he had been brought in as City Manager during the General Strike because “he was supposed to be all things to all people … (He) was supposed to be able to soften up the labor beef … Hassler came into the picture Thursday (actually, Tuesday – R.B. ), after the police had convoyed the trucks into Kahn’s …”, and, at that time, claimed he had nothing to do with the convoy. This was patently false, the Journal said, because Hassler had been present at the meeting Friday, November 29, where the police assault of the following Sunday was planned.42 Why had the AFL committee seemed to place so much faith in Hassler, then? As the emptiness of the settlement became apparent in subsequent days, then, the AFL leaders would denounced Hassler for his “betrayals”. Said the Labor Journal: “Labor is fed up, at long last, with double-crossing and listening to its friends in public life. The only friend we have is the massed picket line and the General Strike. We’ll use it as often as we can to prevent double-crossing and double-talk. 42 Part of Hassler’s assurances on December 5 had been that the struck stores would close, pending negotiations. But the stores remained open. On Friday, December 6, Hassler announced, “I expect the stores to remain open and I expect to give protection to the stores.” Mass picketing was resumed at noon the same day when an effort was made to bring 25 strike breakers into Kahn’s. Within minutes, hundreds of pickets and union sympathizers boiled around the store, shouting at the non-union workers. The threat of trouble was dispelled when strike leaders broadcast a call for all pickets to disperse and participate in membership mass meeting at the Labor Temple. After a two-hour session, pickets resumed their patrol before the two stores, but in greatly reduced numbers. Meanwhile, numerous employees had entered Kahn’s while it was unpicketed and a supply of food was brought in. The local AFL leadership had run up against a seemingly unsolvable problem: how to manage the near-insurrectionary challenge to the establishment that the General Strike had posed within the safe and sane limitations they’d grown accustomed to. Faced with an extremely hostile and aggressive employer community, the conservative search for harmony and collaboration (which these leaders had sought in the past) was no longer workable. Such a policy had made sense to these leaders during the War, when a powerful government mediated between capital and labor, when a spirit of sacrifice dominated the workers, and the expectation of guaranteed profits dampened employer hostility to a much tamed unionism. But now the employers were clearly on the offensive – they aimed to weaken the labor movement. By walking out on their “labor holiday”, the AFL unions were drawing on well-established local tradition. Yet the general strike weapon was a dangerous one. Less militant local unions might break ranks and return to work. Various repressive methods might be employed – troops or vigilante action. The strike could not go on indefinitely. But the employers might be forced to make a settlement if the Strike could hold out a little longer, and if the CIO joined the walkout. How close was labor to winning concessions before Beck’s intervention? Would the employers have remained intransigent if the strike had spread, and had the AFL leaders been more resolute? We will probably never know. Beck’s intervention was decisive in breaking the strike. But an equally important possibility suggests itself. This intervention may have provided the local AFL leaders the excuse they desperately needed to make a weak settlement and preserve their followings at the same time. It may have given them a means for articulating their own apprehensions about the “anarchy”, while giving them a scapegoat for the Strike’s failure to win its demands. Beck, more than any other American labor leader, had long experience with general strikes. A formative experience for him was the Seattle General Strike of 1919, against which, as a young Teamster official, he had led a lonely opposition. Beck had also played a key role in 1934, ordering San Francisco teamsters back to work in that general strike. He rightly viewed the general strike as a revolutionary tactic, and opposed its use no matter what the situation. He was a business unionist par excellence, and a professional anti-communist. He sought to build and consolidate his organization by “selling” the conservative Teamsters union to the employers as a “responsible” alternative to militant and/or radical unions. Beck came from an area that had been a center of I.W.W. activity before and after World War I, where the labor movement as a whole was much more radical than in other parts of the country. He led a union, which, because of its strategic position in the economy, could wield enormous power while limiting itself to narrow objectives and appealing to a narrow stratum of the workforce. Beck ruled his union with an iron and corrupt hand. His close relations with employers gave him great power in handing out jobs – a common feature of many craft unions, which controlled hiring through closed-shop contracts and hiring halls. The employers could do business with Beck and other Teamster leaders, according to Clark Kerr, who knew the Seattle area intimately as a War Labor Board administrator. The Teamsters held to their contracts. They insisted on controlling hiring but left the employers with complete discretion in firing. This was a great bargain for the employers, as was the frequent understanding that, while the truck drivers would be union, “inside” people such as warehousemen, would not.44 But the teamster “craft” was not highly skilled in the usual sense. It could not monopolize its labor market simply by organizing all skilled workers as the true craft unions could. Its power, therefore, all too often rested on collusion with employers and strong-arm tactics both in dealing with recalcitrant employers and rebellious workers. The AFL leadership in the East Bay was divided between the men who had emerged in the organizing drives in the 1930s, who tended to be New Deal Democrats, and the conservatives, led by Charlie Real, who, until the General Strike, was the strongest single power in the local labor movement. He was closely allied with the Republican machine in local and state politics, and embodied the traditional craft union mentality of previous eras. Real was now President of the State Federation of Labor, which had swung the AFL behind Earl Warren’s candidacy for reelection as Governor in the 1946 elections. Real, along with Harry Lundeberg, had also supported the notoriously anti-labor William Knowland for U.S. Senator, causing tremendous anger among the more progressive AFL leaders, who regarded Real as a racketeer and a pawn both of the employers and the Knowland machine. The greatest irony of the Oakland General Strike was that, while it was spear-headed by the truck drivers of Local 70, their leadership was tied to the political machine that provoked it. This was part of a larger conservative opposition to the organizing efforts of the new unions. The Retail Clerks was an AFL union. But, in the same year, Real similarly ordered Local 70 drivers to break a CIO cannery strike. A rebellion developed within Local 70 over this issue, and the membership voted to honor the CIO picket lines. In his oral history, Joe Chaudet, Typographical Union leader and editor of the Labor Journal at the time of the 1946 General Strike, recalls that Real, after his trial in 1936, “became a different man”. The old, militant Real was replaced by a new, finky Real. The transformation reflected the two contradictory sides of the archetypical Teamster personality: combative, rough, courageous, and strong, but conservative, narrow, and often seeking favorable accommodation with the boss. In part, this derived from the evolution of the drayage industry, with its thousands of small employers, where the line between boss and working teamster was often blurred, and where many teamsters aspired, some with considerable likelihood of success, to achieve the status of employer by going into business for themselves. While the Teamsters in the East Bay, unlike their brothers in San Francisco, were harried, persecuted, and largely unorganized during the bleak open-shop era of the 1920s, a tradition of militancy flourished among them. But conservative militancy was violence-prone, eschewing the mass tactics of the more politically radical elements in the labor movement. Real’s career typified the racketeering tendency in which conservative or apolitical nihilism shaded into criminality, finally making its peace with labor’s enemies. The General Strike jeopardized Real’s long-standing relationship with the employers because he could no longer control his members. He was forced to bide his time and look for new ground on which to reestablish his authority. Once the Strike was over, Real’s desperate efforts to settle the Kahn’s strike on the employers’ terms (to remove the Knowland machine’s pressure on him to get the Teamsters to cross the picket lines) failed. Real was now isolated and subject to universal condemnation in the labor movement he had dominated only a short time before. Anti-Communism provided him with the leverage he needed to defend his precarious position. It is clear that when the Alameda County CIO threatened to join the strike and cut off heat and light to the community, it was bluffing.48 What might have happened had this bluff been called is anyone’s guess. But the rhetorical support for the Strike reflected a dilemma the Communist Party found itself in. On the one hand, the Communist Party was anxious to avoid offending several establishments: among those remnants of New Dealism with which it sought an alliance, and elements in the labor hierarchy – like CIO President Phillip Murray, who, under the impact of the anti-Communist campaign, were beginning to shake off their alliance with the Communists that had been firmly established during the War. On the other hand, the Party had to preserve its credit among the very large body of workers who looked to it for leadership. This often meant adopting militant rhetoric, if not action. In Oakland, the search for alliances focused on the Labor Council leadership, which, in most cases, was ungrateful for the attention. The AFL unions repudiate any alleged support or participation the Communist Party claims in the general walkout. Their present boasting of their activities has no foundation in fact or deed, since the AFL unions took steps to eliminate then wherever their unauthorized inflation was discovered. Their reviling of Teamster officials, particularly Charles Real … is wholly unwarranted. The Communist Party’s repeated expose of Real was embarrassing to the Council’s strategy of trying to hold Real within bounds while refraining from public criticism of him. But there was a more important aspect to the liberal AFL leadership’s tirades against “Commies”. To most people, including most CP’ers, the Communist Party represented the threat, or the hope, of socialist revolution, of a mass uprising of the working class. The Labor Council leaders had been excoriated by Beck and the daily commercial press of raising, in microcosm, just such a possibility. The parallel was unbearable to these men, who had themselves been terrified by the enormous human explosion they had been momentarily unable to contain.”54 They could not now announce to their members, or probably even to themselves, that the General Strike had been an awful mistake. But by attacking the Communists they could purge themselves of the guilt of having been at the head of an insurrection. Real and Marshall were brought into the AFL negotiation committee in an effort to ensure their cooperation. The Draymen and the Merchants organized when the Labor Journal called a “squeeze play” outside Kahn’s. Individual truck drivers were ordered through the picket lines, while their employers and St. Sure stood on the sidewalk. But the drivers refused. The Draymen, nervous for their equipment, withdrew their cooperation. As Beck’s pressure on Local 70 continued to mount, the Journal declared “that no one outsider is going to come into Alameda County and apply any pressure on any member or union in an effort to create a split in the labor movement.”57 Real was pleading with the Council leaders to settle the Strike on the employers’ terms, because Tobin and Beck were threatening to place Local 70 under trusteeship if the teamsters continued to refuse to make deliveries. … the fight of the Department Store Clerks against the unfair Kahn’s and Hastings stores was a clear-cut case. It had followed all of the procedures laid down by the AFL Unions. The Joint Council of Teamsters had endorsed the strike as had all official bodies of the AFL. By his utterances to the daily press and by his issuing of orders to locals in Alameda County, the Western Vice-President of the Teamsters, Dave Beck, was playing right into the hands of the Retail Merchants’ Association and was in substance inadvertently acting as a strike breaker. Every union … is supporting the strike. There have been no rifts in the movement, but you can rest assured that some people are trying to create one so that the solidarity of the AFL in Alameda County may be split asunder. As long as that solidarity is there, the employers know that they are licked to a frazzle and their only hope left is to try and split the movement so they may move in. In early February, Real played his last card, announcing to the press and to the Council a new employer offer, which contained key union demands. Knowing this offer to be contrived by Real, the Council accepted it. But the Merchants’ Association immediately repudiated the offer. His bluff called, Real tried to having conveyed the offer in the first place and announced that Local 70 was withdrawing from the Labor Council. In subsequent weeks, the union committee used the phony offer as a wedge to try to dislodge the employers’ refusal to negotiate – offering it as the basis for settlement. They received no reply. But the union had won at least a propaganda point. Once the “settlement” had been reported in the press, the employers’ repudiation of it and continued refusal to negotiate tended to discredit them in public opinion. In March, the Labor Council called for a boycott of all 27 Merchants’ Association stores, and the Building Trades Council implemented a ban on all RMA store construction work. The strike continued. And so did the teamster rank and file’s refusal to cross picket lines. The continuing stalemate in the store strike was a powerful incentive to the labor movement’s efforts, beginning in the immediate aftermath of the General Strike, to wrest local political power from the employers. The Knowland machine had used the police against the picket lines. The Labor Holiday had failed to insure against this in the future when Hassler’s alleged agreement had evaporated. Within the labor leadership a three-way tug-of-war developed between the Council, the CIO and the Communist Party, and Real and the Teamsters. Labor unity was the chief priority for the first two: they hoped to accomplish what the General Strike had not in this regard, to bring together both labor federations, the CIO and the AFL, in a coalition “to combat anti-labor legislation.” Of necessity this meant that the liberal AFL leaders would have to cooperate with the Communist wing of the CIO leadership, which was pushing hard for joint labor electoral action. Real, whose political and union career depended on the continued power of the Kowland machine, viewed this unified movement as a basic threat. He would use the Communist issue to split the movement further, taking all the Teamster locals, in addition to Local 70, out of the Labor Council in an attempt to destroy that body’s viability and with it the base of its leadership. Real hoped that this would allow him to return to his former dominant position in the local AFL. His plan, thus far, did not succeed. The Labor Council did not collapse. But Real was able to use his power over the Teamsters to mitigate the effects of his isolation. And his red-baiting, in tandem with a furious anti-Communist campaign waged by the Oakland Tribune against the labor city council slate, did succeed in causing most of the Labor Council’s leadership to “back away” from the election campaign. Part of this retreat represented defensive, preemptive, anti-Communist rhetoric in the Labor Journal. Hoping to dissociate themselves from the Communists, the Council leaders added a powerful voice to the anti-Communist crescendo. The idea of independent electoral action came directly out of the General Strike. Like the Strike itself, this political impulsive was not purely local either in cause or in the focus of its aims. The Strike was a response to what was viewed by labor as a local manifestation of a nation-wide open-shop offensive, of which the use of a Federal injunction in the coal strike was the latest and most blatant instance. In March of 1947, when the Labor Council and the CIO formed the joint Labor Committee to Combat Anti-Labor legislation, this was viewed as a local effort in a national campaign to unite CIO and AFL against the national drive by employers and the 80th Congress, which would produce the Taft-Hartley Act that year. Over ten years of struggle since the Wagner Act had brought the wages of organized labor to a high peak. But the cost of living, at its highest point in American history, has far outstripped wages. Repeat of corporation and other business taxes has given Big Business a huge war chest with which to fight labor. The year 1946 brought corporations their mightiest profits in history. Government injunction and intervention is used to break the Railroad Brotherhood and Mine Workers’ Union strikes. 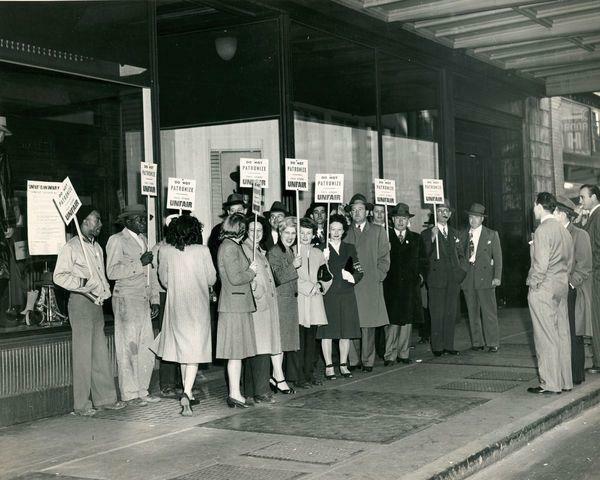 Remember December 1, 1946, when city officials escorted scab trucks through clerks’ picket lines at Kahn’s. Congress lines up 212 bills to weaken and break labor unions. Big Business calls for crippling curbs on labor’s right to organize and bargain collectively. A trembling Supreme Court rules for law by injunction. Your unions, your wage standards, your jobs, your democratic rights, are at stake. The only time when I willingly backed away or was forced to back away (was) when the Council was officially in the … election committee … and Fred Irwin came in and raised all kinds of hell about the Central Labor Council associating themselves with the Commies in the CIO in an election and we had to back away from it. Two days before the May 13 elections, the Tribune printed a front page cartoon showing a Trojan Horse inside the walls of Oakland, with Communists emerging from it beckoning towards City Hall, with swords drawn, as if about to massacre the population. Above the cartoon was a caption, “Beware of Fellow Travelers Bearing Gifts”. Below it was the message, “They then laid siege to the city … and at length, when they had obtained entrance to it, in the interior of a huge wooden horse, which was presented as a gift, succeeded in entering, sacking and burning it.” In the same issue, the Tribune accused Vernon Lantz of belonging to a professional organization at the Radiation Laboratory, “which sought to create labor unrest amongst atomic bomb workers in Berkeley during the war”. Lantz was also accused of having a known Communist on his election petition. Scott Weakley was also smeared as a Communist fellow traveler. Ray Pease was called a wife beater, a child-support delinquent, and a drunkard. The campaign failed to win a majority in the May 13 election. But four out of five candidates won decisive victories in the largest voter turnout in Oakland’s history. Although the aims of the campaign – to put labor in power and begin serious reform in local government – were not achieved, the election was a significant moral victory for labor and the people of Oakland. The voters had convincingly rejected the Knowland machine, police strike breaking, and a city government which was so anti-labor and so biased in favor of intransigent employers that it could provoke a general strike. The vote was also a rejection of the furious red baiting of Real and the Tribune. Cold War ideology and anti-Communist hysteria were not anywhere near as powerful as they would soon become. The Oakland General Strike left important legacies. The workers had shown the employers what they could do, and this unforgettable experience became a restraining hand on business that has lasted to this day. The city election began a process that culminated in the 1958 labor campaign against the Right to Work gubernatorial candidacy of William Knowland. Despite the Labor Council’s local accommodation with the Knowland machine, it became, in some ways, one of the most progressive in the United States, in one of the very few areas that still had a strong central labor body. But not all the results were so positive. The Teamster split prefigured the expulsion of the Teamsters from the AFL-CIO. Local 70 remained under Real’s control, despite considerable rank and file opposition until he was removed by Beck in 1949. Real was sent to prison for embezzling union funds. But Local 70 did not emerge from Beck’s tutelage until 1957. The store employees finally got a better contract at Kahn’s, but this did not last. Oakland’s department stores are still non-union in 1981. Bitter anti-Communism grew in the Cold War period, and was a powerful and lasting component in the thought and action of the local labor movement until partly laid to rest in the 1960s. It created an atmosphere in which workers feared to question the basic values of society. When radicalism revived, it was the students, not the workers, who dared to challenge the old assumptions. But there was still an element of opposition feeling in this labor movement. On a cold early morning in December of 1964, a delivery truck approached a student strike picket line in Berkeley. A bewildered and angry driver was somehow persuaded to call his union – Local 70. He returned, climbed into his truck, and drove away. 1. Don Vial, taped interviews with Bob Ash, C.L. Dellums, George Hunt, Al Applebaum, Paul Heide, George Johns, held at the Shattuck Hotel in Berkeley in 1973. The discussion deals mainly with the impact of the 1934 strike in the East Bay; Paul Montauk interview, February 3, 1981. Mr. Montauk, a socialist and a participant, remembers that disillusionment with the government was very great among labor people in Oakland at the time; Stan Weir, “American Labor on the Defensive: a 1940’s Odyssey”. Radical America, Vol. 9, No. 4-5, p. 163-185. 2. On the fear of fascism, see Barton J. Bernstein, “The Truman Administration and the Steel Strike of 1946”. Journal of American History, March 1966 (Vol. LII, No. 4), 794-795. 3. Barton J. Bernstein, “Walter Reuther and the General Motors Strike of 1945-1946”. Michigan History. Vol. 49, No. 3, September 1965, p. 260-277. Bernstein emphasizes the importance of factional rivalry in Reuther’s initial motivation for taking on G.M., but also that Reuther’s leadership was more farsighted and socially conscious than the traditionalist CIO leadership. See also, East Bay Labor Journal (hereafter abbreviated – EBLJ), September 20, 1946, p. 4 (for local impact of GM-UAW “Open the Books” campaign). 4. Bernstein, Ibid., p. 271, from New York Times, Dec. 30, 1945. 5. Labor Herald, Feb. 2, 1946, Oakland Tribune, March 18, 1946, p. 1. 6. For summary of maritime strike, see San Francisco Chronicle, Dec. 1, 1946, “This World” section, pp. 3-4; also Oakland Post Enquirer, Sept. 7, 1946, p. 1, Sept. 12, Sept. 14, Nov. 23. 7. EBLJ, Apr. 26, May 10, and Aug. 29, 1947, EBLJ, p. 1, for Report to State Federation of Labor by Bob Ash. 8. Ibid., October 18, 1946. 9. Ibid., October 18, 1946. 10. EBLJ, Oct. 25, 1946, Nov. 1. 11. Ibid., Nov. 1, p. 4. 12. Al Kidder in “Remembering Oakland’s Big Strike,” Labor Pulse, December 1977; Richard Jay, A Case Study in Retail Unionism: The Retail Clerks in the San Francisco East Bay Area. Unpublished Ph.D. Thesis. Economics, U.C. Berkeley, 1953, pp. 309-317. 13. Jay, Ibid., p. 330-331; St. Sure Oral History, p. 453; Frankie Moore, Sr. interview, Apr. 14, 1981. 14. EBLJ, Nov. 29, 1946. 15. Joe Chaudet interview, Feb. 14, 1981. Accounts of these events are contradictory. Interview heavily relies on the account of James F. Gulliano, EBLJ, Dec. 6, 1946. 16. The streetcar incident is also given contradictory portrayals. Kidder says that Al Brown was driving the streetcar. However, Vera Stanbauw insists that Brown was a full-time union official and not a Key System employee at the time. Interview, Apr. 15, 1981; Dec. 2, 1946, p. 1; San Francisco Chronicle, Dec. 2, p. 1. 17. Ash interview, Jan. 30, 1981. 18. Joe Chaudet, “Remembering Oakland’s Big Strike”, Labor Pulse, December 1977. 20. On Monday’s crowds, accounts are again contradictory. The 10,000 figure is from Contra Costa Labor Journal, Dec. 6, 1946, p. 1; on Monday’s meeting, San Francisco Chronicle, Dec. 2, 1946, p. 1; Milk Drivers, George Hunt interview, Mar. 2, 1981; Einar Mohn, Oral History, Corinne Gibb, interviewer, March 1970, p. 314. Institute of Industrial Relations, U.C. Berkeley. 21. Irene Atkinson interview, April 20, 1981. 22. On crowd size on Tuesday, accounts vary. The 20,000 figure, much larger than most, is from Women’s Wear Daily, Dec. 4, 1946, cited in Phillip J. Wolman, “The Oakland General Strike,” Historical Society of Southern California, 1975; Post Enquirer, Dec. 5, 1946, p. 2; St. Sure’s Oral History, p. 457. No labor source or person interviewed remembers pickets going to East Oakland. The employers’ voluminous itemization of this has been destroyed. 23. On restaurants: San Francisco Chronicle, Dec. 4, p. 7; interview with retired Local 70 official, who preferred to remain anonymous, Mar. 2, 1981. 24. Bill Horton interview, Apr. 14, 1981. Question: “Why were all the grocery stores, gas stations, etc., shut down?” Answer: “It was a general strike and we weren’t going to let anything run until it was settled.” On West Oakland grocery stores – interview with Frankie Moore, Sr.
25. San Francisco News, Dec. 3, p. 1. The mail-order workers were members of Teamsters’ Local 853 – interview with Bill Clifford, May 26, 1981. 26. For invisibility of leadership, Weir, p. 179; Tribune incident, Chaudet interview. 27. For accounts of strike violence, see all San Francisco and Oakland dailies; police captain’s account – Tribune, Dec. 5, 1946, p. 17. 28. Interview with Jack Sweeny, Sr., Feb. 27, 1981; Labor Action, Dec. 16, 1946, p. 2; People’s World, Dec. 5, 1946; Weir, p. 178; San Francisco Chronicle, Dec. 5, p. 14; San Francisco Call-Bulletin, Dec. 5, back page. 29. Weir, p. 178; Labor Action, Dec. 16, 1946, p. 2; People’s World, Dec. 5, 1946. 30. EBLJ, Dec. 6, p. 2; Contra Costa Labor Journal, Dec. 6, 1946, p. 7; Labor Action, Dec. 16, 1946, p. 2; West Coast Sailor, Dec. 13, 1946, p. 2; Weir, p. 180; Bob Ash, “Remembering Oakland’s Big Strike”. 31. 32. San Francisco Chronicle, Dec. 4, p. 1, pp. 7-8, and Dec. 5, p. 3; Tribune, Dec. 5, p. 2; San Francisco Call-Bulletin, Dec. 2, p. 2. 32. San Francisco News, Dec. 3 (page not indicated) ; San Francisco Chronicle, Dec. 4, p. 1. 33. San Francisco Chronicle, Dec. 5, p. 2. 34. Mohn, Oral History, pp. 313-316. Mohn interview, April 28, 1981; Chaudet interview; San Francisco Chronicle, Dec. 4, 1946, p. 7. 35. Post Enquirer, Dec. 5, p. 2; Tribune, Dec. 5, p. 1; S.F. Chronicle, Dec. 5, p. 4. 36. S.F. Chronicle, Dec. 5, p. 1; Anon. Interview, Feb. 2, 1981. George Hunt, also a witness to this discussion, vehemently denies that Marshall said this, however. 37. Mohn, Oral History, p. 315; Mohn interview. 38. S.F. Chronicle, Dec. 6, p. 2; Post Enquirer, Dec. 6, p. 3. 40. S.F. Call-Bulletin, Dec. 5, p. 1; S.F. Chronicle, Dec. 6, p. 3. 42. EBLJ, May 9, 1947, p. 1. 43. EBLJ, Dec. 13, 1946, p. 4; S.F. Chronicle, Dec. 7, p. 3. 44. Clark Kerr Interview, Apr. 14, 1981. 45. Joe Chaudet, Oral History, Earl Warren Series, Labor Leaders View the Warren Era, Frank Jones, interviewer, 1973; Pete Marshall interview, Apr. 14, 1981; Vial tapes. 47. Bridges’ opposition cannot be documented. This is based on interviews with two former Party members who wish to remain anonymous. 48. Ron Weakley interview, Mar. 29, 1981; Bill Clifford interview, Feb. 13, 1981..
49. Interview with Local 1304 retirees, Bob Dwinelle and Ed Kintz, Mar. 2, 1981, and with Local 1304 member Al Fradodavich, Feb. 13, 1984; Jim Kiernan interview, Feb. 16, 1981. Kiernan says that the C.P. expulsions were massively documented by one of the expelled communists, but that this material was stolen. Also see The Militant, Dec. 14, 1946. On CIO Council – Ron Weakley interview. 51. Lloyd Lehman, “The Oakland General Strike,” Political Affairs, February 1947, p. 178; Weir; p. 183. 52. Los Angeles Times, Dec. 6, 1946, Section 2, p. 4. 53. EBLJ, Dec. 13, 1946, p. 1. 54. Jay, Retail Clerks, p. 325. 55. I am grateful to Mr. Richard Berman, who has done extensive research on the Local 29 purge, for much of this information. Also, Bill Clifford interview; EBLJ, Apr. 25, 1947; People’s World, Apr. 28, 1947, p. 6. I am informed by the present officers of Local 29 that a four-volume transcript of the trial of the three officers has disappeared from its archives. 56. EBLJ, Dec. 20, p. 4. 57. EBLJ, Dec. 7, p. 1. 58. EBLJ, Jan. 17, 1947, p. 1. 59. EBLJ, Jan. 31, 1947, p. 1. 60. EBLJ, Feb. 14, p. 4. 61. EBLJ, Feb. 28, 1947, p. 1. 63. Ash interview; Ole Fegerbaugh interview, Mar. 2, 1981. 64. Ash interview; Chaudet interview; Joseph Smith interview, Feb. 19, 1981. 65. Tribune, May 11, 1947, p. 4; Wolman, p. 175; Weir, p. 181. 66. Ash in Don Vial tape. 67. Interviews with Smith, Fegerbaugh, Montauk, Stan Weir; Labor Action, Apr. 14, 1947, p. 8. 68. Tribune, May 7, editorial; Ron Weakley interview. 69. EBLJ, Mar. 28, pp. 3-4; Apr. 1, p. 4; Apr. 15, p. 3; May 9, p. 4. 70. Tribune, May 10, May 13.